In “Chapter One: The Vanishing Of Will Byers,” Stranger Things establishes the importance of keys and doors, using everyday objects both to symbolize the unknown and to hint at portals to another place. In “Chapter Two: The Weirdo On Maple Street,” it doubles down on that imagery. Some of that is purely practical: Eleven hates to be shut away, even as long as it takes to get dressed. Confined, studied, and scrutinized for an unspecified time, she has no notion of privacy, only of isolation and imprisonment. Intently and with few words, she and Mike negotiate leaving ajar the door to the basement-playroom bathroom where she’ll strip off her wet t-shirt and put on the clean, dry clothes he’s offered. Mike showing off his TV, his Yoda, and his Dad’s La-Z-Boy to El (as he’s nicknamed her) is a deliberate echo of Elliott introducing E.T. to his Greedo, his fish, and his Pez dispenser. But El isn’t E.T., and Mike’s immediate acceptance of her as a completely alien presence rings false. As far as he knows, she’s just a lost girl—a little strange, but just a kid. Lucas keeps calling El “a weirdo,” but she isn’t quite weird enough to justify Mike’s easy assumption that she knows nothing. Until she reveals her extraordinary talents, it’s decidedly off-kilter (and decidedly lazy writing) to have him treat her like a blank slate without better motivation. But he does, and even displays an unlikely facility with El’s curious gaps in knowledge. When she sits on his dad’s La-Z-Boy, he knows that not only will she be surprised by it, but that to let him show her how it works will require an act of trust; he unhesitatingly answers her “Promise?” not with the reassurances that should prompt, but with a definition. She points at a photograph of Will, and Mike “just knows” she knows what happened to him. Maybe all this can be chalked up to an affinity between El and Mike, but if so, the writing needs to make that clear. It’s one thing for Mike to view El, even before the revelation of her abilities, as a confounding alien entity. It’s sloppier for the show to treat her that way. The inconsistency of El’s supposed blankness is revealing. The Hawkins researchers didn’t teach her what promise or friend mean, but somewhere along the line, she learned pretty–and prioritized it so highly that it’s the first word she utters spontaneously, unprompted. Mike’s saccharine explanations of promises and friends, or even his providing food and shelter, aren’t what anchors El’s faith in him. It’s a shut door, opened again, that does that. El resists being shut in his closet while he distracts his mother, but Mike insists. The gratitude in Millie Bobby Brown’s eyes when he opens the door again is heartbreaking, almost enough to repair the clunky oversights that came before. A lot of the action, actual and proposed, revolves around doors: El beating on a cell door, begging for “Papa!” to set her free; Jonathan busting through doors in his father’s new home; Joyce listening outside the closed door to Will’s room. To get El help without getting himself in trouble, Mike plans to send her out the basement door and around the house to the front door. There, she’ll ring the bell for his mother, who will know what to do. His instructions prompt El to one of her few utterances: “No.” Brown has a level, uncompromising quality that can be winning or intimidating. She doesn’t seem like an adult, but like a supremely certain child, which gives her an air of uncanny gravitas. Before the boys can do anything, El backs up her refusal with a demonstration of telekinesis, slamming the door shut and locking it. El has good reason to be adamant. If she goes, there will be trouble. But if she stays, it will be double. As Joyce’s terrifying visit to Will’s room shows, doors and locks aren’t enough to keep danger out. Whatever’s reaching out, it can lunge right through walls—through realms, or dimensions, or space-time, or whatever construct Stranger Things posits that keeps its monster at bay (mostly) and keeps Will trapped on the other side. “The other side” is literal. 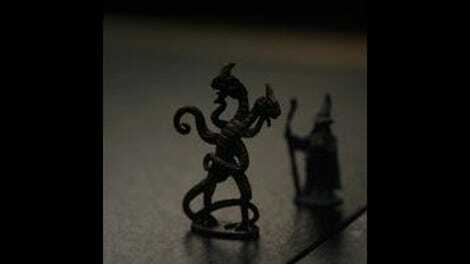 When the boys show El their D&D set, she sweeps all their figures off the board, flips it over to its featureless black underside, and slams down Will’s figure, then the dreaded Demogorgon that’s pursuing him. “He’s good at hiding,” Jonathan tells Chief Hopper, and he’s right. Will’s so good at hiding, he seems to be both close by and impossibly distant. He’s so good at hiding, so far he’s eluded whatever horror is after him, wherever he is. And he’s calling out from there. From whatever obscure world he’s trapped in, he sends a message to his mother, crying out in garbled syllables that conjure up an image of Carol Anne calling plaintively to her mother through the TV. The Duffer brothers’ goal is to make a show about characters, not just monsters, and they’ve half-succeeded. Chief Hopper’s taciturn intelligence is a treat to watch. Dustin wins my heart scene after scene with his extraneous moments of incredulity at, well, everything. (His open-mouthed stare at his hand after Lucas shows El how to spit-swear is a great bit of incidental action.) 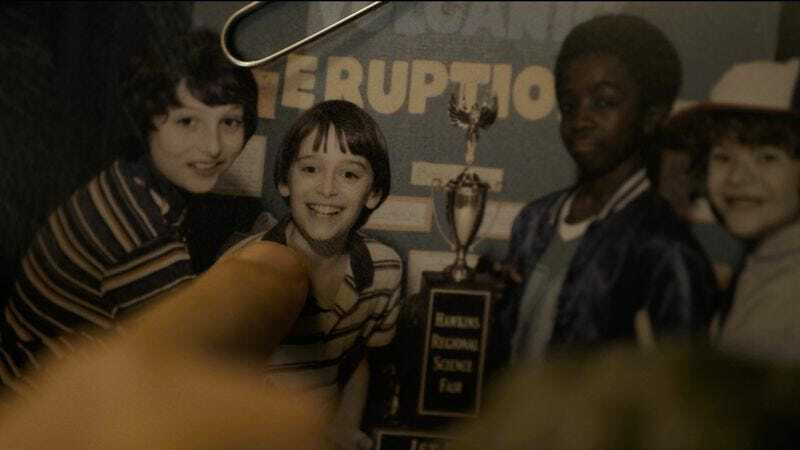 Will’s character is grounded in the few minutes before he disappears, when he confides his D&D roll to Mike and seals his character’s fate, and the show fleshes him out deftly in flashback, assisted by Noah Schnapp’s open face and likable affect. Other characters just don’t spark, and “Chapter Two” spends a lot of time with them. Nancy’s romance with Steve is dull, dull, dull. It plays like the boring background action in a lesser John Hughes movie, except we’re watching lumbering long minutes of it. Their teenaged frolicking pays off by positioning Barb (Shannon Purser) alone in the night and putting Jonathan there to photograph everything except the moment of her disappearance. But what an interminable slog to get there. The masturbatory wind-wind-wind as Jonathan reels in his exposed film notwithstanding, his voyeurism has limits. He eagerly snaps candids of the teens cavorting and of Nancy in Steve’s bedroom window, but shies away from capturing their embrace. Instead, he focuses on her friend sitting alone poolside while couples pair up inside. Jonathan’s last photo is a grainy black-and-white of Barb that would look right at home on a Have you seen me? poster or a cautionary newspaper story. And that’s just where Barb will end up. In addition to the episode title’s obvious reference, “The Weirdo On Maple Street” is a sly nod to The Twilight Zone episode in which the real monsters are—wait for it!—humankind. Like Stranger Things, “The Monsters Are Due On Maple Street” gets a lot of mileage out of electrical outages and staticky phone lines. 1980s anachronism alert: Jonathan’s really ahead of the curve name-checking The Smiths for that mixtape he gave Will. That scene occurs while their father still lives with them, at least a year before the series opens in November of 1983. So Jonathan is into The Smiths six months or more before their first single is even released. That is one Manchester-savvy rural Midwestern high-schooler. 1980s autobiographical detail: This episode includes both a song my first boyfriend and I sang on our way out of the movie featuring it and the song to which we first Did It. I’m not telling you which is which. A note on watching Stranger Things on a laptop versus on a TV: That Carpenter-inspired score is more thrumming, and downright thrilling, through earbuds, but the lighting is much clearer on my television. Poor Jonathan, who cranks The Clash for his little brother to drown out his parents’ fighting, whose father greets him by slamming him into a door, who feels responsible for Will’s disappearance because he took an extra shift at work. Lonnie’s a creep and a lousy parent, but he has a point about Joyce, who doesn’t seem to notice until music starts blaring from Will’s room that her older son’s been missing all night, too. How many phones is Joyce going to burn through? It gives a new meaning to the phrase burner phone, but the expense highlights the desperation of Joyce’s life even before Will disappeared. This isn’t the family from E.T. or Poltergeist. This is a family barely scraping by. They’re close to the edge, and getting closer. There’s no reason to put in that crane shot of the chief and his deputy standing on the edge of the quarry unless the quarry shows up again. “The chief and her? They screwed before, huh?” Stay classy, deputy.